Japanese ICT giant buys $100 million stake in the growing grid-scale battery market. A123’s grid-scale battery business has taken another step in its post-bankruptcy saga, from the United States to China, and now to Japan. On Monday, Japan’s NEC announced it would spend $100 million to buy A123 Energy Solutions, the non-automotive lithium-ion battery and system integration branch of A123, from China’s Wanxiang Group. Monday’s announcement represents a comeback of sorts for NEC, which in 2012 joined U.S. battery powerhouse Johnson Controls on a joint bid for bankrupt A123’s assets. Wanxiang, the Chinese automotive manufacturing powerhouse, ended up winning A123 with its $251 million bid, and has since been growing both its automotive and stationary battery business lines. Owning A123 Energy Solutions instantly gives NEC a leadership position in the global market for grid-scale battery installations. 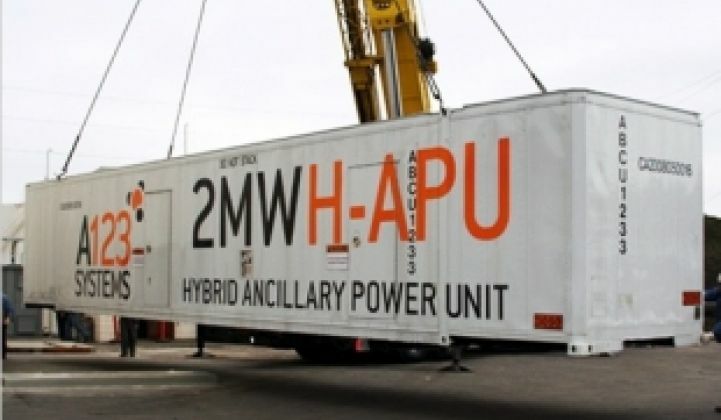 A123 has deployed more than 110 megawatts of its lithium-ion storage systems around the world, making it a contender with the likes of BYD, Mitsubishi, Panasonic, Samsung, LG Chem, Johnson Controls and Saft for top slot in grid-scale lithium-ion battery chemistries. In fact, grid-scale storage made up roughly one-quarter of A123’s business prior to its bankruptcy. While most of its projects were completed before that, and some large-scale ones got canceled after its bankruptcy, the past few months have seen a reinvigorated A123 Energy Solutions land new projects in Spain, China, and most recently, Japan. Hideki Niwaya, vice president of NEC's smart energy business unit, told the Wall Street Journal that NEC expects global sales of energy storage systems to utilities to grow from less than $2 billion in 2015 to about $6 billion by 2020. NEC plans to marry its information and communications technology with A123’s energy storage systems integration expertise in a new business unit to be called NEC Energy Solutions, expected to begin operations in June. The company will provide turnkey storage systems from utility-scale to behind-the-meter storage at the kilowatt scale for residential, commercial, or industrial sites. Customers will include NEC’s existing telecommunication, enterprise and government customer base, as well as new ventures targeting growth markets. That includes China, where NEC and Wanxiang plan to establish a joint venture, the companies stated. NEC will also bring its own in-house lithium-ion battery technology to the table, along with A123’s lithium nanophosphate battery technology, as options for projects. While A123’s grid-scale projects so far have used its own batteries, its experience in integrating batteries, power electronics and the all-important software control systems that manage the interplay of battery and grid needs is an asset in and of itself. NEC’s move matches a growing push in Japan to bring integrated, scalable battery storage products to market. Last month, we covered Panasonic’s LiEDO platform, its planned networked computing platform for its stationary batteries now being installed in the thousands as part of a set of Japanese “smart city” projects. The goal is to closely monitor each battery system’s performance for safety and reliability for the end customers, as well as orchestrate their use to maximize their long-term economic value as grid assets. Japan’s post-Fukushima energy crisis has put its utilities and their businesses and residential customers under immense pressure to lower their peak electricity usage, provide their own emergency backup power and integrate renewables like wind and solar PV into everyday grid operations. But the market for customer-sited energy storage is also growing in the United States, where GTM Research predicts a collective 720 megawatts will be installed by 2020. Wanxiang issued a Monday release saying that it remains fully committed to growing its A123 battery business for automotive applications, particularly micro-hybrids. Wanxiang decided early this year to buy bankrupt hybrid vehicle maker Fisker Automotive for $149.2 million, and has pledged to seek to restart production of Fisker’s high-end Karma sports car, as well as considering whether to finish the factory where Fisker had planned to produce its mid-priced Atlantic hybrid sedan. That could help boost A123’s automotive battery business, since Fisker was a key A123 customer. But it would also appear to pull Wanxiang further away from stationary, large-scale battery installations as a core business -- although Wanxiang did make it clear that it intends to continue selling its battery cells for commercial and industrial applications.